Hey everyone! 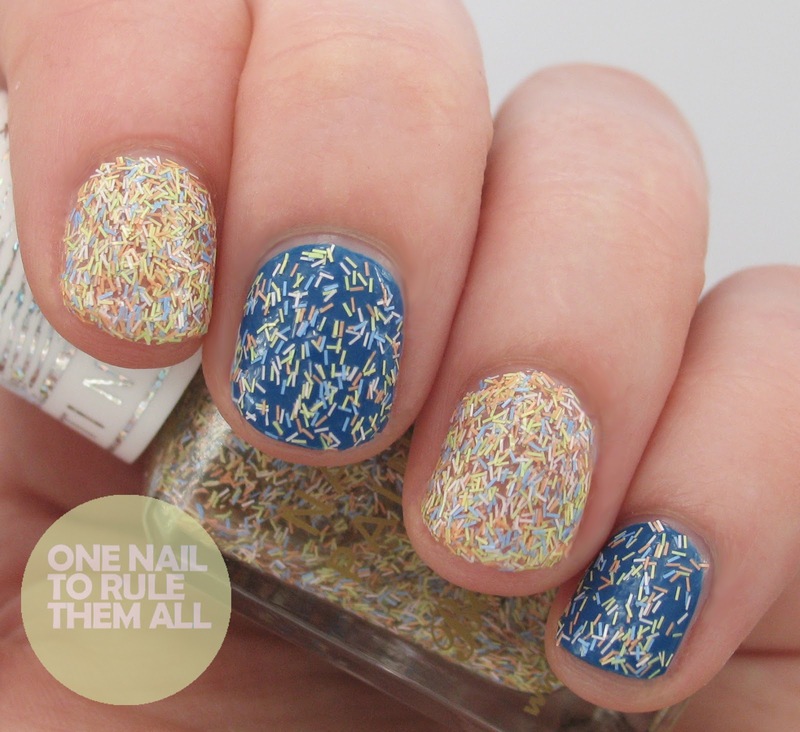 Today I have a review of the new Confetti Nail Polish* from Barry M to show you. I intended to post these weeks ago but never got around to editing the photos, so even though I'm sure you might have seen these around I hope you enjoy them anyway! I decided to try something a little different to the other reviews I've seen and show you what they look like alone or layered over another colour, rather than just layered. 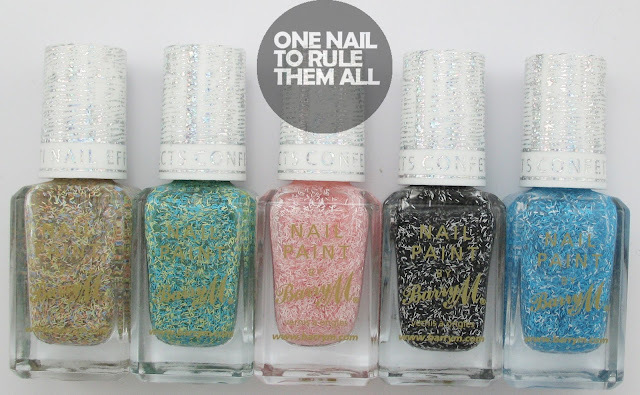 These are available now on the Barry M website and will be available in Superdrug on the 5th June and Boots on the 12th priced at £3.99. 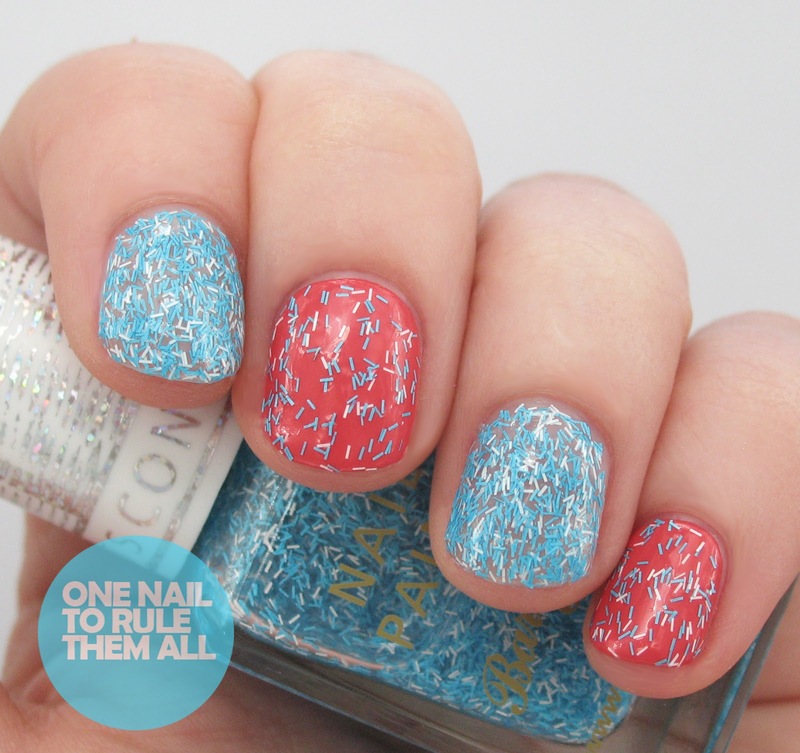 These have been compared to the feathers effect collection by Nails inc but these are definitely the more affordable option if you're looking to buy some. I dont own any to compare but I'm assuming these are just as good. As always the pictures and review will be after the jump! 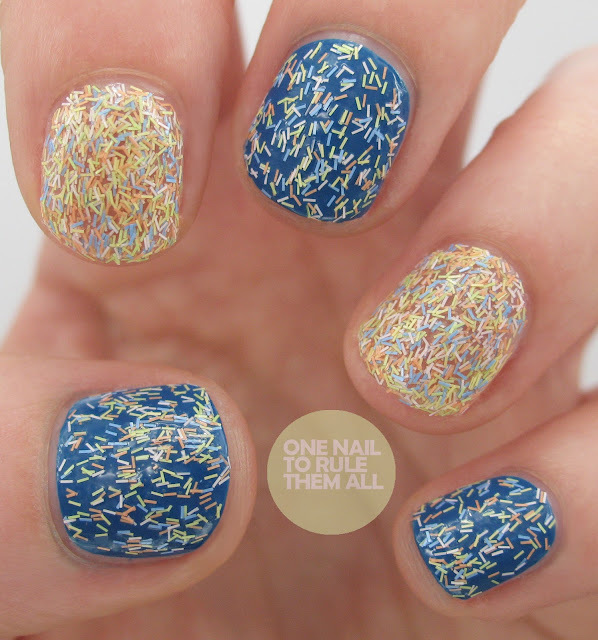 First up is 'Sour Apple'* which is the blue and yellow/light green confetti. I struggled to find a colour to put this over because I felt like I'd already exercised all my options with the other glitters, so I chose to put it over Barry M 'Mushroom'. There are 3 coats on the ring and pointer fingers, with a slight amount of placement needed, and 1 coat on my other fingers, again with a little bit of placement. Next up is 'Bubblegum'* which is a blue and white glitter. I put this over Barry M 'Passion Fruit' from the new Summer 2013 Gelly Collection. Again it was 3 coats on the ring and pointer finger and one coat elsewhere, and placement was also needed with these. Next is 'Liquorice'* which is a black and white glitter, I know a lot of you love black and white glitters so this is definitely a good one for you! Again, 3 coats on the ring and pointer finger and 1 elsewhere, but I did a bit of extra placement with these which is why the layering looks a bit thicker. Last but certainly not least is 'Marshmallow'* which, suprisingly, is my favourite out of the bunch. I expected to like Liquorice the most but for some reason that was replaced as soon as I applied this. Again, 3 coats on the ring and pointer finger and 1 coat elsewhere. Overall, I'm really impressed with this collection. I love the names and I love how they look. As I've mentioned before I dont use the foil removal method for glitter and so I ended up using Essence - Peel Off Basecoat* underneath to make things easier, so I'm afraid I can't be of much help in the removal department. I would recommend getting at least a couple of these if you can because I think they're great! 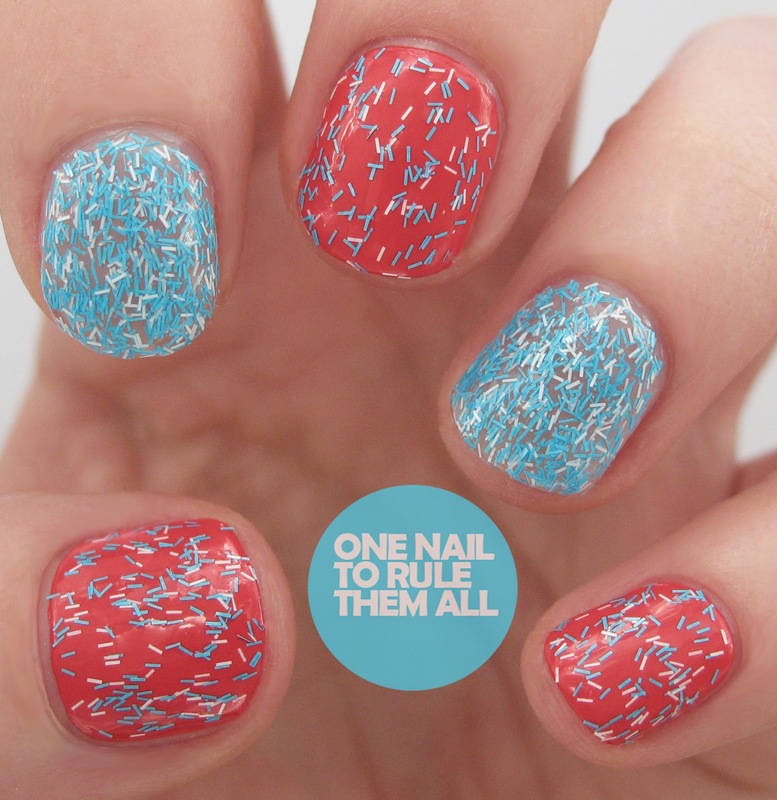 I think these look neat on other people, but I just don't think I'd really groove on having them on my nails! These are the best swatches I've seen of this range yet, they look great! Damn they keep bringing out too many nice polishes I am going to be poor the time I get them all lol. These swatches are amazing. Cant wait to buy them.